& It's 100% Free To Attend! 2 TRACKS - Selling Medigap / Selling Senior Solutions. 2 HOURS OF CE - See The program for details. HUNDREDS OF EXPERTS - Networking galore! 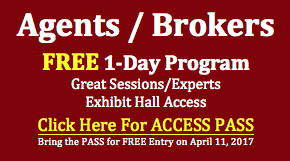 81 Exhibitors - Insurers, marketers, leads & more. 100% FREE - No-Cost Access for this outstanding day. We will send the 1-page Access Pass to the E-mail address you enter. PRINT OUT THE PDF AND BRING WITH YOU TO THE EVENT ON APRIL 11th. NEED A DUPLICATE? Simply E-mail us again for your ACCESS PASS. Click the link above to open a PDF showing program sessions, timing and speakers. On the day before the 9th National Medicare Supplement Insurance Summit we open the doors and offer FREE ACCESS to agents who want to learn more, hear from top national experts and meet with insurers and others who will be attending the 3-day national conference. We'll have two tracks of sessions running. One will focus on Medicare Supplement. The other will focus on short-term care insurance and other senior products. You can sit in any session. You can also meet with the many exhibitors who'll be present. THERE IS NO COST TO ATTEND -- BUT YOU WILL NEED TO PRINT OUT AND BRING THE FREE ACCESS PASS. We will have workshops from about 8:00 AM until about 3:15 PM. No food is served (this is a free event!) but there are plenty of available choices at the hotel or within a few minutes walk ... or bring a couple of protein bars so you won't miss a minute of this great opportunity. Those attending the FREE day of programming will NOT be able to attend any of the regular conference program (that begin Tuesday evening). FOR INFORMATION ON THE NATIONAL MEDIGAP SUMMIT, click any of the buttons on the RIGHT. The national conference requires a paid registration. If you wish to attend the regular conference, we offer a limited number of reduced rate scholarships for agents and brokers. Click the banner banner. Park in the hotel's parking structure across the street from the front of the hotel (On Olive Street). We will have special vouchers that will save you $8.00 when parking at the hotel's parking structure. Details will be available at the event. For those coming in the night before, we have a block of discounted hotel rooms at the Sheraton. Click on the Hotel Reservations button on the right to see the current rate for rooms. Discounted rates are limited, so please book early.